Please join the WI CCA Board and congratulate Jeff Laufenberg as the 2018 Wisconsin Certified Crop Advisor of the Year! Jeff grew up on an 800-acre dairy farm and is a graduate of UW Platteville. Jeff has been working in agriculture for 33 years and is currently the Technical Development Lead for Syngenta. 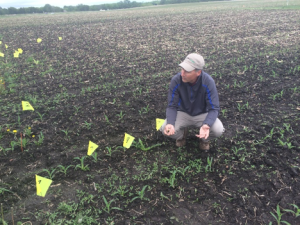 His role with Syngenta allows him to advise several farms on crop production, pest management and soil fertility issues and he manages a territory from the Dakotas to Michigan. Brian Madigan, Country Visions Cooperative, must be recognized for his effort to coordinate and submit Jeff’s nomination. Several aspects of his nomination stand out to me as being important contributing factors to Jeff’s successful career. First, Brian writes that Jeff has become the “go to guy” when troubleshooting problem weed, diseases and insect problems. His broad ranging skills help people understand problematic issues like herbicide mode of action, soil fertility and economics. Assisting growers to make the best informed decisions as possible. He hosts field days and guest lectures at other covering broad reaching topics. Jeff has conducted and participated in several replicated research trials and is the foundation of Brian’s description of Jeff as being “data-driven”. Jeff has also put his broad range of knowledge and experience to good use by mentoring several young agronomists, farmers and interns. Inspiring them to answer challenging questions by understanding issues that can expand their trade to the next level. Please join us in congratulating Jeff. Job well done!